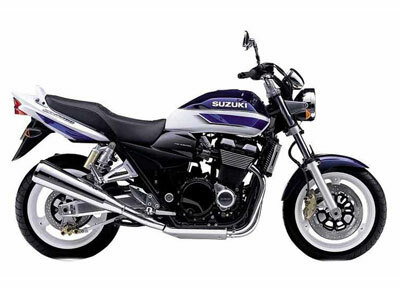 Suzuki’s big-bore muscle bike looked hard as nails, but was actually a big softy at heart. If we’re honest here at CB-Net, what we really wanted when we first heard about the Suzuki GSX1400 was a bit of a Wes Cooley rep, GS1000S-type machine. OK, so when it finally broke cover in 2001 the GSX was a good-looking bike, but it all could have been so much better. After all, Kawasaki were selling shed-loads of Eddie Lawson rep ZRX1100 and 1200Rs, so why didn’t Suzuki play shrewd? The bike itself had fully adjustable suspension, a ‘proper’ air-cooled motor and looked pretty good in Suzuki corporate blues. Like most of the other retros of the early noughties, the GSX didn’t actually need to change much in its life and instead it got on with the job and became a bit of a do-it-all bike for many fans. It wasn’t always used just for posing at the pub, we saw many GSX1400s kitted out for touring… which was a tad weird. At the end of its life in 2006 the UK got the limited-edition GSX1400 FE (for Final Edition) while Japan got what we should have all had in the first place – a Wes Cooley Replica, complete with GS1000S colour scheme and that all-important bikini fairing. Shame we didn’t! HANDLING: This is the GSX’s big bug-bear. It’s a pretty wobbly ride. This could be down to the front suspension being a bit under-damped and under-sprung as new and that this is a big (228 kilo) dry machine! SUSPENSION: As we said, it can be wibbly: some owners suggest four rings out on front preload, four clicks from hard on the compression and six from hard on rebound at the front-end. At the back try third ring down on preload, rear rebound and compression both on three. By now, many will have had updated suspension. Ask the seller what the score is as updated springs/ thicker fork-oil are the most basic of mods. Oh and the rumour was that some rear shocks did leak on early models. Red springs show that it could be a Japanese import! QUALITY CONTROL: Not bad for a Suzuki and much better than the Bandit 1200. FUEL-INJECTION: Clean and crisp, but was changed for 2005, along with a catalyser and a 4-2-1 exhaust (three kilos lighter, see) but with a longer end can. Changes to the FI helped acceleration still further as well as adding a fast-idle system. ECONOMY: The 22-litre fuel tank should see you good for around 40mpg meaning range between fill ups can be up to around 160 miles at best. COMFORT: Remember we said it was strange that people toured on these? Perhaps not… the seating here is plush and comfy for two. You’ve also got a 10.8 litre storage space under the seat. WHY WE LOVE IT: Big and cuddly. WHY WE DON’T: Wibbly-wobbly! Price now!